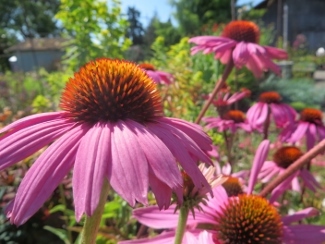 Joy Creek Photo Archive (c) all rights reserved Echinacea purpurea 'Ruby Star' is a selection with intense carmine red rayed flowers and very sturdy stems. The petals stay flat and do not droop back like many other forms. This prairie plant is very cold hardy. Don't forget to sniff the central cone of the flower. It may be a little prickly but has a delicious fragrance.